Wave World is an excellent example of an ensemble of multi-talented musicians and artists who are influenced equally by things both inside and outside music. Their creative output has been inspired by an interesting mixture of momentous sci-fi movies, novels and comic books, classic LPs of Electronic Music, visionary art, advances in technology and the ever-perplexing complexities of the human condition - all in hopes of revealing something about humanity by looking back at ourselves from the perspective of an outsider. And the ultimate outsiders they are. The trio of Gert van Santen, Harry Kessels and Rolf van Slooten make up Wave World, and have made up entire planets and inhabitants possessing their own imagined space creature culture and technology. 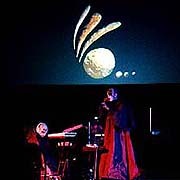 The beings of Wave World's fictional realm even have their own language, which is occasionally incorporated into concert performances and studio albums. 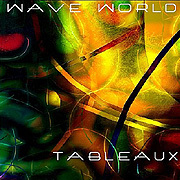 Tableaux (78'58") and Hieroglyphs (77'43") are CDs which include a few moments of extraterrestrial lyrics, but mainly these releases are dedicated to the sonic portrayal of Wave World's ultra-detailed imaginary astral system. While this description may make these works seem quite "high-minded" or "philosophical", they actually provide an enjoyable listening experience. Tableaux is the more overtly Ambient of the two. With its beautiful sustaining textures and atmospheres, reverberant piano solos and very little in the way of rhythm if the listener dozes off while it is spinning sleep during that time will be a very interesting activity. On the other hand Hieroglyphs offers more in the way of kinetic musical energy. There are a number of slow zones where the listener will wander in contemplation. Tracks expand outward from these points in layers of advancing synthesized chords, circles of sequencer tones and full-throated silvery lead lines. 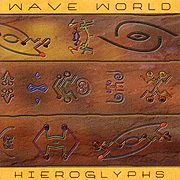 Another interesting thing about Hieroglyphs and Wave World is that although everything about them is electronic, a fair amount of the music sounds as if it came from a lost primeval forest or jungle, or is native to some indigenous tribe. The acoustically modeled sounds effectively mimic rhythms made with metallic or wooden instruments as well as the macrocosm and engulfing ambiance of an alien world. Ultimately, while performing all dressed up in space alien costumes, praying in an imagined tongue and synchronizing synth music to a vivid otherworldly video fantasy may seem like low-brow art, the work of Wave World does manage to raise poignant questions about our own planet - more so than current so-called "serious" art does. They move the mind of the beholder to notice just how far we as a species have drifted from the Eden-like world of our own beginnings.